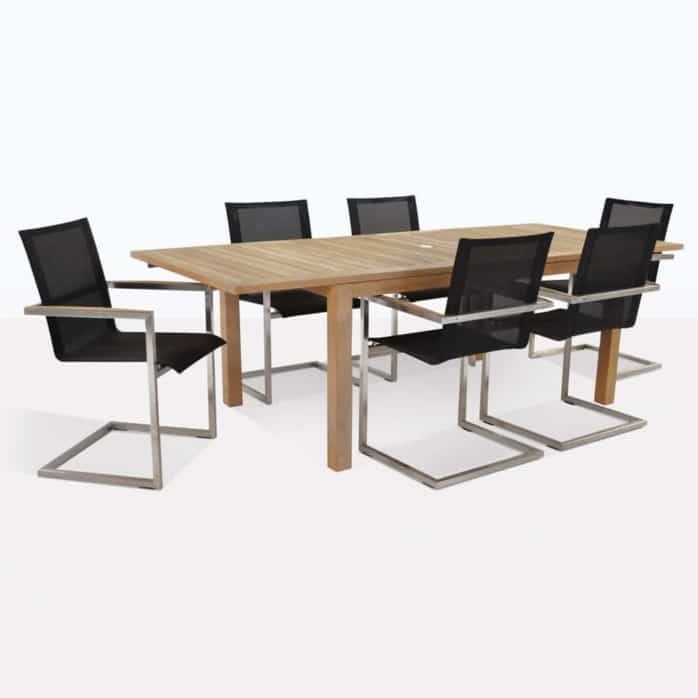 Dramatic, contemporary and splendidly comfortable; Design Warehouse is proud to introduce you to the Monaco Teak Dining Set with 6 Bruno Chairs. 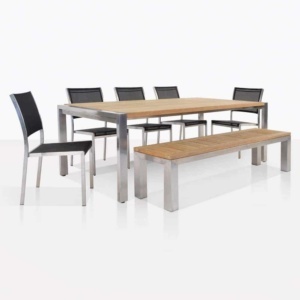 This effortlessly modern dining set begins with the Monaco Table, with an extension that takes the table from 1.6m size to 2.4m in length. Its simple design features tightly placed slats of Grade A Teak with #316 Stainless Steel fittings and Umbrella Hole Cap. The Monaco is paired up with 6 of our stunning Bruno Chairs, with a unique sleigh shaped frame and Batyline® mesh; this whole look is contemporary brilliance. 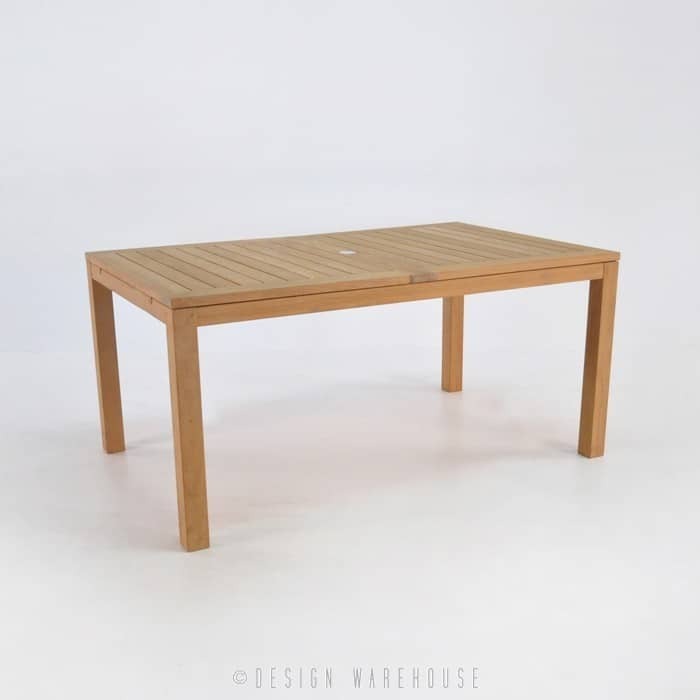 Dramatic, contemporary and splendidly comfortable; Design Warehouse is proud to introduce you to the Monaco Teak Dining Set with 6 Bruno Chairs. This effortlessly modern dining set begins with the Monaco Table, with an extension that takes the table from 1.6m size to 2.4m in length. Its simple design features tightly placed slats of Grade A Teak with #316 Stainless Steel fittings and Umbrella Hole Cap. The Monaco is paired up with 6 of our stunning Bruno Chairs, with a unique sleigh shaped frame and Batyline® mesh; this whole look is contemporary brilliance. This entire modern dining set is wonderfully treated to cope with the elements. This clean, stylish and comfortable setting sports a mixture of Grade A Teak, Batyline® mesh, and #316 Stainless Steel. Grade A Teak is plantation teak from Indonesia, cut at a prime age to ensure that there is a high level of naturally generated rubber throughout and that the wood won’t age #316 Stainless Steel is marine grade, meaning that it wont rust or deteriorate outdoors. Batyline® mesh is an amazing European brand used all over the world, from boats to loungers to these incredible chairs. We also carry a superb range of outdoor wicker such as the Viro® and Woven® brands, all treated to work with the elements, so they will not discolour, change shape and will stay beautiful for years to come. At Design Warehouse we care about quality, and we should! We’ve been doing it for years, and it is why we are the leading supplier of outdoor furniture in New Zealand and beyond! You only have to check out our clients page on this website to see the extent of commercial properties we cater to. 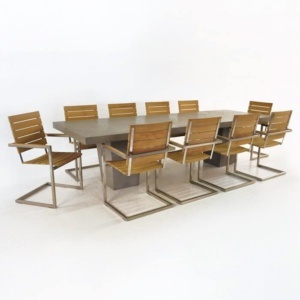 Perhaps you love the Monaco Teak Dining Set with 6 Bruno Chairs but need more seating. Why not look into adding some of our sofas and club chairs to add a relaxing area to escape to after a large meal. Choose a Teak framed deep seating collection to tie the look together. Or maybe you want something a little more chunky? 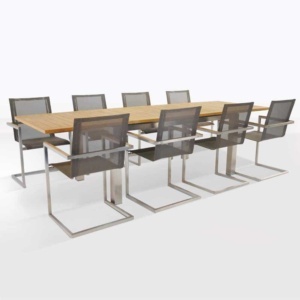 Never fear, we have a great range of stainless steel tables in different sizes that go brilliantly with the Bruno Chair. We love to put together divine settings for our customers. Call us today or enquire online with any questions, queries or concerns. Our Monaco Teak Dining Set with 6 Bruno Chairs suits many different areas, try this setup on a concrete patio for a sharp and chic look, or break the soft lushness of your garden with the clean lines of this modern dining set. 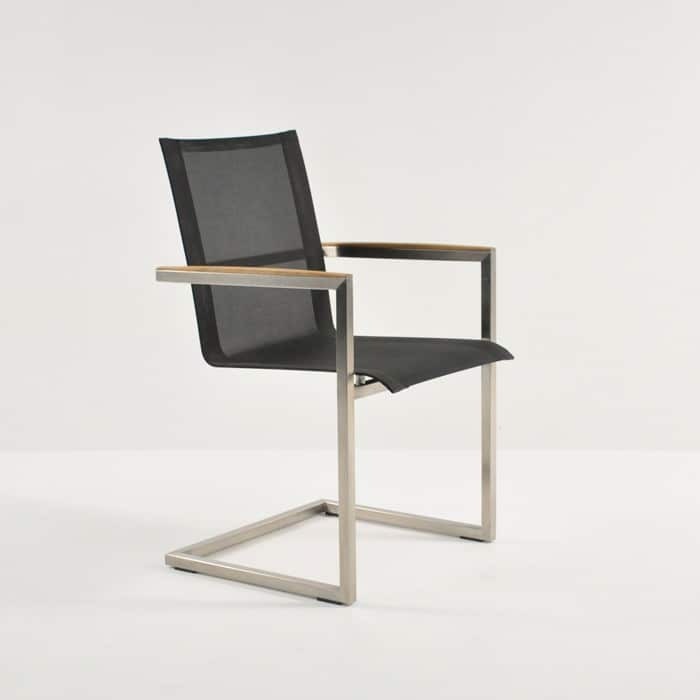 The Bruno Chairs are shown here in black, but are also available in white and taupe, giving you choice to cater to your style as well as the tones of your space.